Nothing gets us excited quite like playing around with a spirit we’ve never encountered. And so today we’re happy to introduce you to Mahia — the Moroccan-inspired fig spirit you never knew you needed. Though the brand available in the States is distilled in Yonkers — not exactly North Africa, we know — Mahia is based on Moroccan distilling traditions (and by a master distiller raised in Morocco), starting with ripe figs that are fermented and then distilled. When you hear that it’s made from figs, don’t think that it’s sweet. It’s up at 80 proof, just as boozy as a vodka or tequila, and while there’s a genuine flavor of figs, and indeed a subtle sweetness, it very much drinks like a spirit. Almost like a figgy grappa, that also has a pleasant anise flavor. Since it’s a full-on spirit, you can swap it in for vodka, gin, or white rum in all sorts of drinks — or you can find ways to highlight its fig and anise with other Mediterranean-inspired flavors. Here are three of our creations. We could’ve called this a “Moroccan Mojito,” but we restrained ourselves. Regardless, Mahia’s fig and anise come alive with fresh mint, and a little fresh lime and club soda take it into super-refreshing territory. If you’re paying attention, white spirit + lime + sugar + club soda is a mojito… but this version is even more vibrant than the original. Instructions: To an empty cocktail shaker, add 10 mint leaves and 1/2 ounce of simple syrup. Gently press on the mint leaves. Add ice, along with 1 1/2 ounces of Mahia and 1/2 ounce of lime juice. Shake all that up until well-chilled, and strain into a tall glass with fresh ice. Top with 2 ounces of club soda. Garnish with a straw, 3 lime wheels, and a big bouquet of mint. Instructions: In the bottom of a cocktail shaker, muddle 3 small ripe figs and 2 teaspoons of rosemary leaves. Add ice, along with 1 ounce of bourbon (Wild Turkey is great here), 1 ounce of Mahia, 1/2 ounce of freshly squeezed lemon juice, and 1/2 ounce of simple syrup. Shake all that up until well-chilled, and double-strain (through the cocktail’s own strainer, and through a fine mesh strainer) into a rocks glass filled with crushed ice. 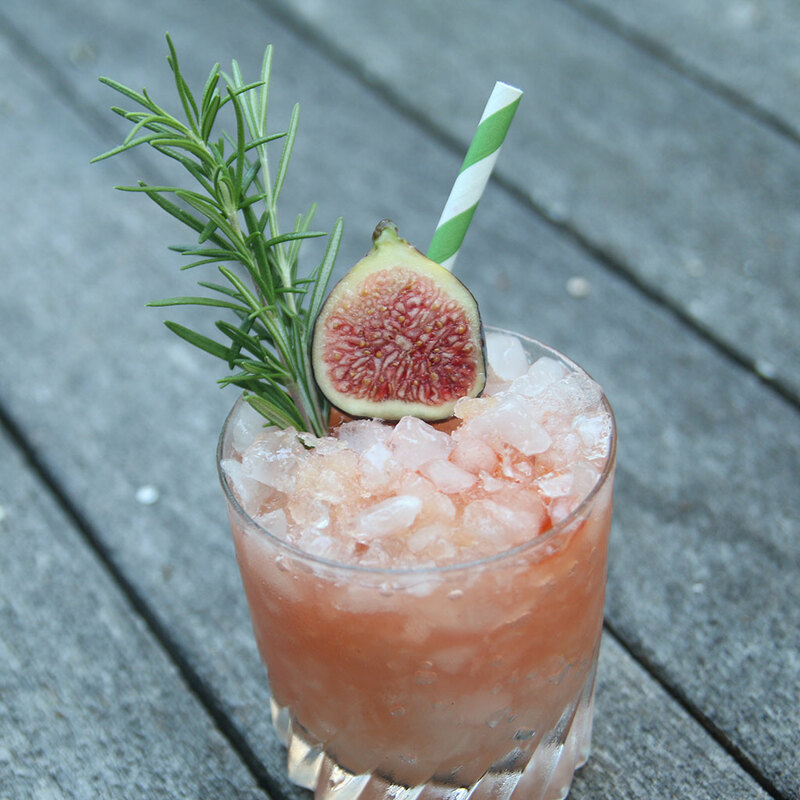 Dash some Angostura bitters on top, and garnish with a rosemary sprig, 1/2 a fig, and a straw. When we think about Mediterranean fruit, figs immediately come to mind, but pomegranate isn’t far behind. The two fruits go really well together, and since you can buy 100 percent pomegranate juice at any store (POM works great), it makes cocktails that much easier. Adding an egg white gives this drink a light silkiness; a grating of fresh cinnamon, another Moroccan accent. Don’t skip it. Instructions: In a cocktail shaker without ice, combine 1 1/2 ounces of Mahia, 1 1/2 ounces of pomegranate juice, 1/4 ounce of freshly squeezed lemon juice, and 1/2 ounce of honey syrup (that’s honey cut 1:1 with hot water). Add an egg white, a dash of orange bitters, and a dash of Angostura bitters. Shake all that up without ice — the “dry shake,” to fluff up the egg white — then add ice and shake again. Strain into a chilled cocktail glass and garnish with 1/2 a fig and a fresh grating of cinnamon.